There are certain ingredients that are considered heroes in the skincare world: Vitamin C for brightening, retinol for skin renewal and hyaluronic acid for hydration, to name a few. If you’ve been paying attention, you’ve probably also heard of peptides, which are essential for anti-aging. Is it a must or fluff? Here’s what you need to know. In short, peptides are messengers that tell your skin to produce more collagen, the essential protein responsible for taut, uplifted and smooth skin that’s abundant in youth but slowly degenerates as you get older and progressively exposed to environmental aggressors, like UV rays. Collagen is made up of amino acids. Peptides are composed of amino acids, usually about three to five of them strung together, and they are formed when collagen breaks down. In other words, think of peptides as shorter segments of collagen. Peptides essentially tell your body that collagen has deteriorated and it’s time to make some more. And the more collagen your body makes, the more you can delay the appearance of wrinkles, sagging and lack of bounciness. 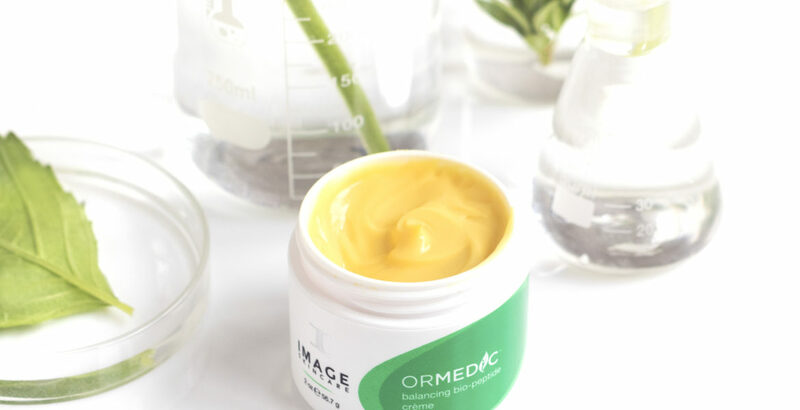 Also, peptides, such as palmitoyl tripeptide-5 found in ORMEDIC balancing bio-peptide crème, can also help diminish fine lines by inhibiting muscle contraction. Think of it natural Botox—without the needles. Does Science Back Up Peptides? Yes! Studies have shown that peptides applied topically in skin care can in fact make a difference. One study from the National Institutes of Health confirmed that peptides send messages to your skin to prompt more collagen production. Even though the peptide creation isn’t occurring naturally within the body, applying it onto your skin via skin care tricks your skin into thinking it needs to generate more collagen. In another study, researchers compared a moisturizer containing a peptide with a placebo form and found that the former dramatically reduced the look of wrinkles by increasing collagen. An incredible antioxidant, green tea contains high levels of polyphenols, which are abundant in epigallocatechin gallate (EGCg), to help fight free radical damage. It is 20 times more powerful than antioxidant vitamin E! Another super-antioxidant, ubiquinone helps regenerates aging skin. Our vitamin C comes in the form of BV-OSC (tetrahexyldecyl ascorbate), one of the most advanced and stable types of this potent antioxidant that also brightens and stimulates fibroblasts (the cells that produce connective tissue). More naturally derived antioxidants that help combat the effects of aging, UV rays and other environmental assaults. A natural substance found in skin that binds 1000 times its own weight in water and helps support collagen. A naturally moisturizing and softening botanical carrier that stimulates, heals, tones and firms skin. A lightweight, easily absorbing moisturizer high in Vitamins A and E and helps soothes sensitive, dry or sunburned skin. It also supports elastin. Also known as Karite, this certified organic oil butter is an excellent emollient and emulsifier. Shea butter protects against drying, accelerates healing of superficial wounds and irritations and possesses a slight photo-protective action. Contains amino and organic acids that helps strengthen the skin’s delicate acid mantle. Whether you’re already seeing the signs of aging or want to prep your skin for the future, anyone can begin incorporating peptides into their skincare routine. Because of the revitalizing ingredients in our ORMEDIC balancing bio-peptide crème, even those with sensitive, irritated or unbalanced skin can use the cream every night to reap the wonderful benefits of peptides and keep wrinkles at bay.